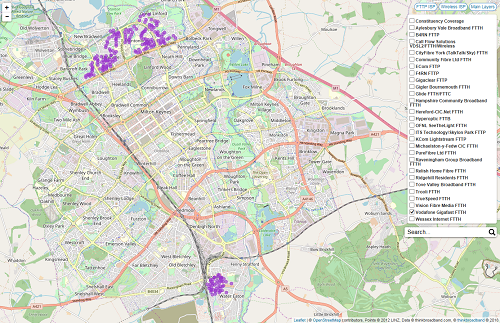 More full fibre for Milton Keynes as we have spotted the Vodafone Gigafast service is now available in the Bletchley area and the original area has expanded to a bit of more of Great Lindford. The FTTP service starts at £23/m for existing Vodafone pay monthly mobile customers, with customers new to Vodafone paying £28/m for a 100 Mbps symmetric service. The full speed option Gigafast 900 (Gigabit symmetric connection) costs £43/m for the existing pay monthly mobile customers or £48/m otherwise. Some people may be able to avoid the £49 cost of the engineer install. The funny part is that so many people now claim to sell the UK's fastest broadband speeds and the caveat Vodafone are using is 'Vodafone Gigafast is the UK’s fastest broadband when compared to other major providers Virgin Media, Sky and BT'. Things in the Gigabit broadband sphere are going to get interesting in the battle for the best speed headline particularly once the footprints grow and start to overlap, since performance at peak times is the key. Update Midday: Some parts of Fenny Stratford have been spotted as postcodes where the Gigafast service is now available. The postcodes are in coverage system so those comparing broadband packages can quickly spot the fastest option for them and the map layer will update later today. Unsurprisingly, these appear to be in areas that already have superfast broadband available. Urban areas are going to end up with more superfast/ultrafast ISPs than customers, all trying to undercut each other's prices, and none of them making any money. While in rural areas Vodafone and others don't provide any broadband at all. Broadband coverage in the UK is close to 100%. Vodafone, etc, aren't required to provide fixed line broadband everywhere. I would speculate that operators have run the numbers and decided on the areas they are deploying to based on those. In the case of Vodafone they are building out from CityFibre metropolitan networks so will only cover towns and cities where these networks are for right now. Think you profoundly underestimate just how much more it would cost them to get fibre to those areas with few options - they weren't left sparsely covered for fun. Same issues apply even more here. I'm acutely aware of the issues and costs surrounding rural broadband, and I understand the business case for only covering profitable urban areas. However I'm disappointed that large companies are allowed to do so by the regulators. Businesses are not allowed to discriminate on grounds of race, age, gender, etc, but are almost encouraged to discriminate by location. Never mind, in a few years the USO will entitle us country folk to 1% of the speed available to people in urban areas, and a choice of one ISP. @sheephouse Out of curiosity who do you think should be paying for you to get FTTP where there could be no likelihood of a return on that investment? If the "state" where should they source the funds? Remember that there are many with slow speeds and a similar lack of choice as yourself living in urban areas including the major cities. @sheephouse I wasn't aware that general taxation paid for my libraries, gas and and sewers. I admit that much intercity/region transport received subsidies, especially so rail, I'm not so sure that this is true for local buses and the like other than of course for any subsidy provided by the local authority. As for your having no main drainage the cost of any new provision is down to those to be served whether rural or urban. I would expect the same to be true for the provision of a new gas supply. cont. It's easy to forget who originally paid for infrastructure when first installed and I include, for example, the provision of new roads, where before being "adopted" the cost of making good and surfacing the roads are met either by the developer if a new development, or the adjoining property owners who pay by the length of their frontage if the road was pre-existing but not formally adopted. @MCM999, if not from taxation, who does pay for your libraries? Who is paying for a large part of Crossrail? Who is contributing >20% of TfL's costs (this year)? Who paid for gas mains before British Gas was created in 1986? Who pays for maintenance of roads? An awful lot of infrastructure is funded by taxation. Even BDUK's broadband improvements are largely funded from taxation.